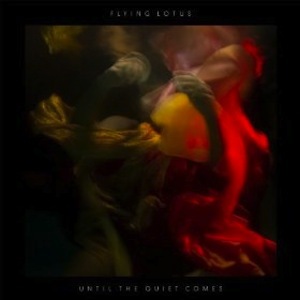 Carefully tinkling like a music box running out of steam, Flying Lotus’ Until The Quiet Comes is a new millennium lullaby. FlyLo dials back the 8-bit prog-jazz freak-outs of 2010’s Cosmogramma, and for a moment one misses expecting the unexpected. Requisite parlor tricks still dazzle. If just one mainstream MC recorded over inspired stutter-start tribal rhythms like “Heave(n)” and the title track, hip-hop might be culturally relevant again. Just our luck said MC would prefer the carelessly minimalist “Putty Boy Strut,” a hand clap loop stalked by a middling melody. The stunningly nasty funk that closes otherwise rote rump shaker “The Nightcaller” should be on Adult Swim any day now. Thundercat and Laura Darlington’s respective collaborations, the AM Gold soul of “DMT Song” and glitch ballad “Phantasm,” come across as perfunctory compared to their previous work with FlyLo. A barely recognizable Thom Yorke nails the lascivious “Electric Candyman.” The seductive percussion succeeds admirably until the last minute, when it pointlessly falls down some steps. “Hunger” immediately follows and seals the deal thanks to Nikki Randa’s ethereal siren call and the astonishing baroque folk outro. Listeners should be patient with Until the Quiet Comes, as its somnolence frequently yields naughty payoffs.